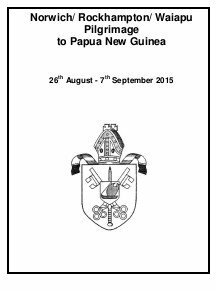 Our pilgrimage to Papua New Guinea in August 2015 is a real adventure and the journey of a lifetime. The 23 pilgrims are preparing to leave the cosiness of home for a journey across the world to a land of rain forests and islands. We are a small group from three countries, the U.K. , New Zealand and Australia. journey in pictures and words. For pilgrims it will give a record of this special time and for those at home it is a chance to follow the journey as it happens. repellant, have inoculations. We also get ready in our thoughts and prayers. chance to see how God’s world is fulfilled in different ways.